Since last year's Mercedes-Benz Fashion Week Australia Lisa Ho has aimed her label at a broader audience taking her collection from strength to strength. Utilising this season's key statement prints and structures, Lisa has created mimimalist luxe that can suit any woman. Wedgewood prints, China porcelain patterns, bold navy stripes, peplums, metallic textures and cut outs has her new Spring Summer 2013 collection brimming with classic silhouettes and a timeless colour palette of navy, red, black and white. Like last year Lisa's models showcased the hairstyle of the season, with slicked back dip-dye blue ponytails set off by fabulous bold lips. It was Serena van der Woodsen meets Blair Waldorf, the perfect mix of statement basics and modern chic. 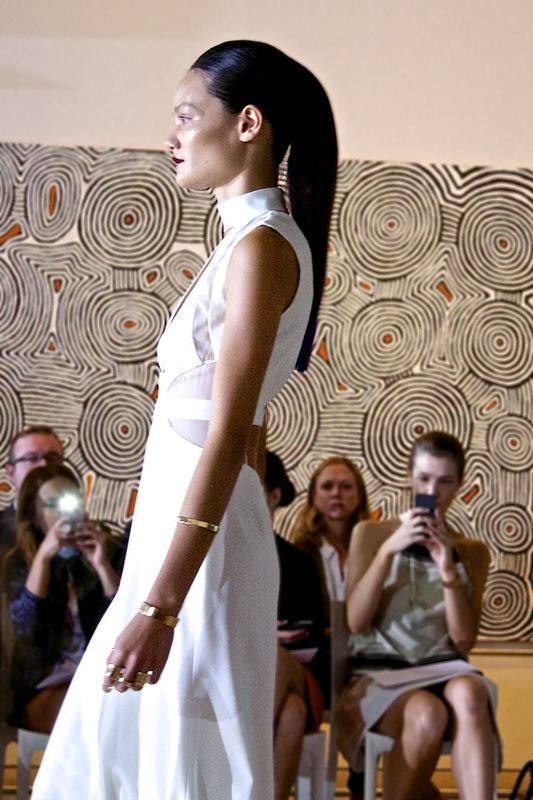 Held at the majestic Art Gallery of NSW, it could not have been a more perfect start to Day 3 of MBFWA. oh my goodness....going ga ga over the blue floral printed flowy dress...YES PLEASE!